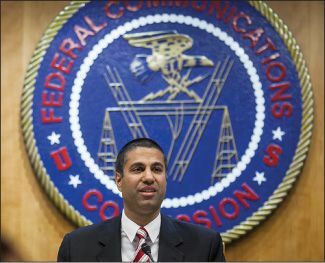 “More media consolidation may be coming, thanks to President Trump’s Federal Communications Commission,” said Seth Fiegerman in CNN.com. The Republican-led agency last week voted 3-2 “along party lines” to repeal 40-year-old rules preventing a media company from owning a radio or TV station and a newspaper, or from owning multiple TV stations, in the same market. The regulations were put in place in the 1970s to ensure that the public would hear a diversity of views. But in the age of the internet, said Trumpinstalled FCC Chair Ajit Pai, such restrictions are outdated. To critics, the ruling seems “tailor-made to allow” the nation’s biggest TV station owner, Sinclair Broadcast Group, to proceed with its plan to buy Tribune Media, another massive station owner, said Ted Johnson in Variety. Sinclair, which requires its stations to run conservative commentary on national topics, would own 223 TV stations nationwide—far more than any other broadcasting company—reaching roughly 72 percent of U.S. households. Sinclair chairman David Smith is friendly with President Trump, and Smith has been accused of using pro-Trump news coverage to “help grease the wheels” for the deal. Jettisoning these “archaic rules” is a “good thing for consumers,” said Steve Pociask in Forbes.com. Local TV stations are battling “the twin tornadoes of Facebook and Google” for ad dollars—and they’re losing the fight, forcing them to cut back on reporters or even go off the air. Local newspapers, too, are in the throes of an advertising and revenue crisis. Allowing “modest media consolidation” would allow media owners to inject these enterprises with new funding and take advantage of economies of scale. “Clearly, consumers are better off keeping newspapers and broadcast stations open for business.” Had the FCC made this decision in the 1980s or ’90s, we’d be concerned, said The Kansas City Star in an editorial. But the digital era has “fundamentally changed” the media landscape. Consumers have countless news and entertainment options today on their TV, phone, or computer. “If you don’t like what Sinclair says, turn the channel.” Or better yet, go online, where “anyone with a camera and computer will be able to provide local news that can compete with the other stations” in your market.